The U.S. government and African partners met in Addis Ababa, Ethiopia, for a dialogue on strategic approaches to countering violent extremist messaging in the greater Horn of Africa region. The Feb. 23–28 workshop was co-hosted by the Africa Center for Strategic Studies and attended by approximately 60 professionals. The communication abilities of extremist groups were on display during the September 2013 terrorist attack on Westgate Mall, in Nairobi, Kenya, by the Somalia-based Al Shabaab group. During the four-day siege, the attackers orchestrated a sequenced social media messaging campaign explaining why they had carried out the attack, providing their version of events inside the mall, taunting the Kenyan government, and sowing panic among Kenyans. Al-Shabaab and other extremist groups have long understood that communications are domain of modern warfare, said Ambassador Taye Atske Selassie, a senior official in the Ethiopian Federal Ministry of Foreign Affairs, speaking to participants at the opening of the workshop. Ambassador Selassie said extremists groups have invested time and effort into understanding strategic communications and, as a result, are able to coordinate attacks much more easily. He called on the U.S. and African partners to employ a two-pronged approach centering on countering the terrorist message itself, while at the same time delivering communications to reach out to vulnerable groups that are at risk of being radicalized or recruited. Africa Center Acting Director Mr. Michael Garrison said that growth and sophistication of terrorist organizations requires, rather than a reactive approach, a more proactive and coordinated approach that creates greater synergies throughout inter-agency organizations and with African partners. 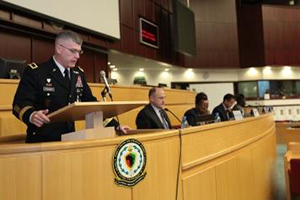 Brigadier General Wayne Grisby, Commander of the Combined Joint Task Force–Horn of Africa (CJTF-HOA), a U.S.-led task force based in Djibouti, echoed Mr. Garrison’s remarks by calling for the deliberate employment of all available tools of statecraft – diplomacy, strategic communications, military operations, intelligence, development and financial tools – in a comprehensive strategy in close coordination and partnership with African nations. Brig. Gen. Grisby urged interagency and African partners to pay closer attention to strategic communications and messaging as valuable, but still underutilized, instruments of statecraft. Throughout the workshops, attendees planned to discuss the drivers of extremism, face-to-face messaging, identifying credible voices, and crafting alternative visions to challenge the conceptual bases of terrorist messages. To reflect the inter agency aspect of the partnership, several U.S. agencies, in addition to ACSS and CJTF-HOA, were participating, to including the U.S. Department of State, the Defense Threat Reduction Agency (DTRA), U.S. Africa Command (USAFRICOM), and the Near East and South Asia Center for Strategic Studies (NESA).